"The butterfly's attractiveness derives not only from colors and symmetry: deeper motives contribute to it. We would not think them so beautiful if they did not fly, or if they flew straight and briskly like bees, or if they stung, or above all if they did not enact the perturbing mystery of metamorphosis: the latter assumes in our eyes the value of a badly decoded message, a symbol, a sign." 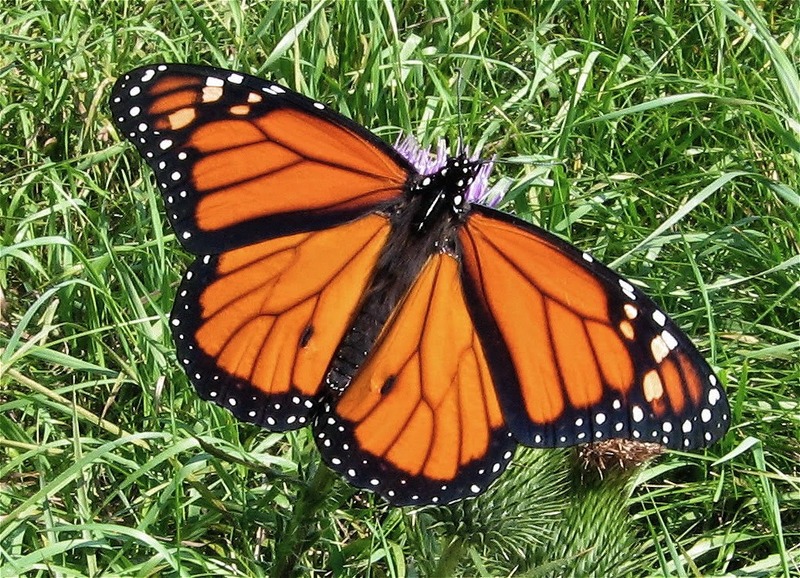 Shown here is a male Monarch. Males sport black dots on either side of their lower wings close to the abdomen, and have narrow black wing veins. Females lack the dots, while their wing veins are thicker than the males. 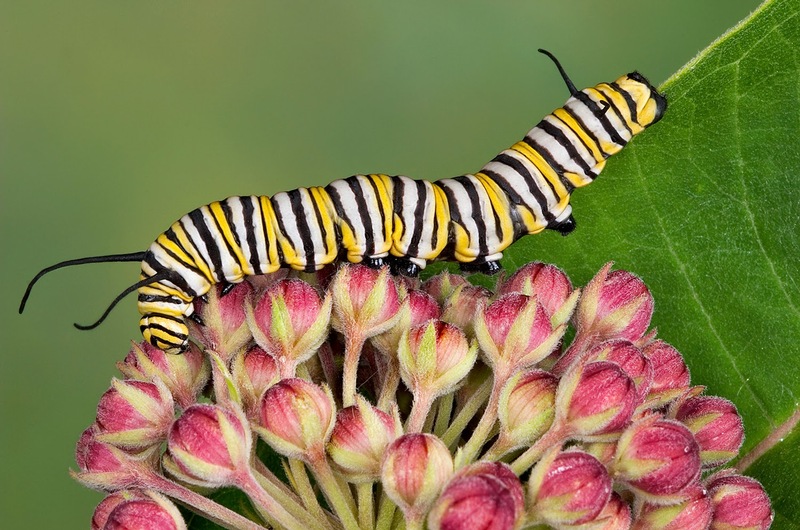 The Monarch Butterfly of North America is an iconic butterfly specie that in the last decade or so has seen an abrupt decline in population, especially in the Midwest and Eastern strains. Several factors are involved in what are considered severe population crashes. One is the eradication of much of the native milkweed plants that Monarch caterpillars exclusively dine on in Midwest farms and ranches. 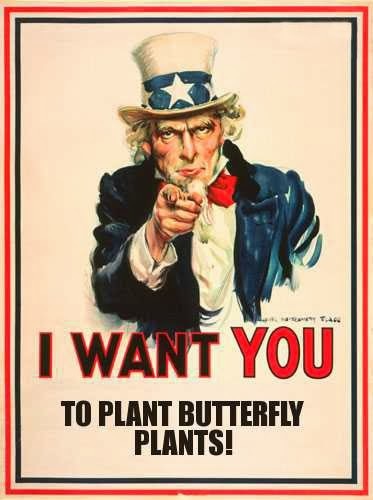 That is why it is so important to plant milkweed in private gardens, community parks, and anywhere anyone is willing to tend some. The bulldozing of wild, open spaces for building is another. Thirdly, the overwintering sites in Central Mexico for the Midwest and Eastern strains have been systematically destroyed through logging, poaching, and land clearing for agriculture. The western strain found in California and the Northwest, overwinters along the Southern California coast, are faring better, but have also been impacted due to host plant and habitat loss. 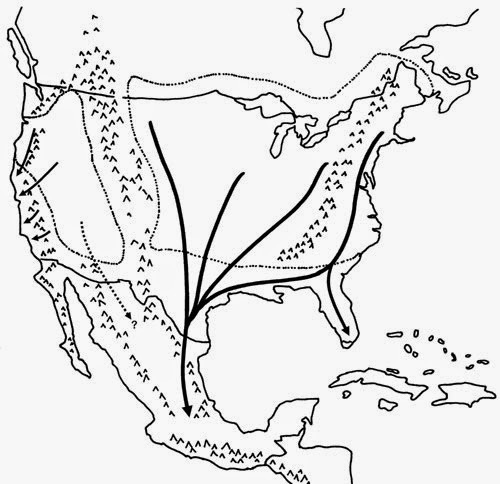 Monarch Butterfly fall overwintering routes. Reverse directions in spring and summer. Monarchs travel many miles from southern overwintering sites back home up north, and back down again. 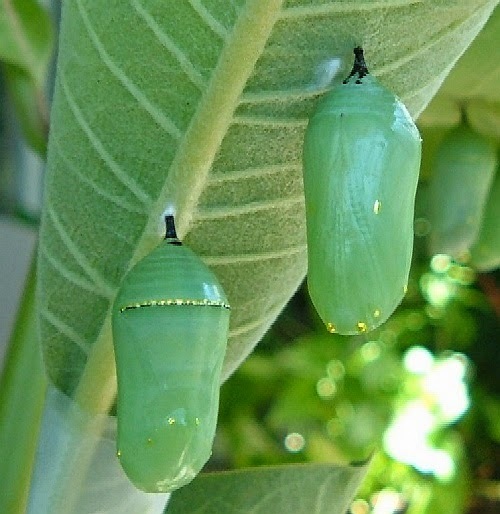 Along the way, they need milkweed plants to lay their eggs upon to produce more progeny; no milkweed, no progeny, no progeny, extinct creature. Once they get down to their overwintering grounds and the areas are seriously decimated or even extinct, there is no safe place for them to ride out the winter's cold, and subsequently die or are severely reduced in numbers. There are quite a few native North American milkweed species and several exotic non native ones that monarchs host on. One of the most common for gardeners is Tropical, or Mexican Milkweed. Prolific and easy to grow, this handsome plant makes a fine addition to any garden. It can be found in almost any local nursery center nowadays. Many of the North American natives make good garden plants also. The species endemic the the western half of the United States tend to be more xeric (growing in dry places), so care must be taken to not over water them in the average garden. Many of these are well suited to growing in large pots where watering regimes can be better monitored. To list all of the different milkweed plant species here would be daunting, so an online search for milkweed would be better served. 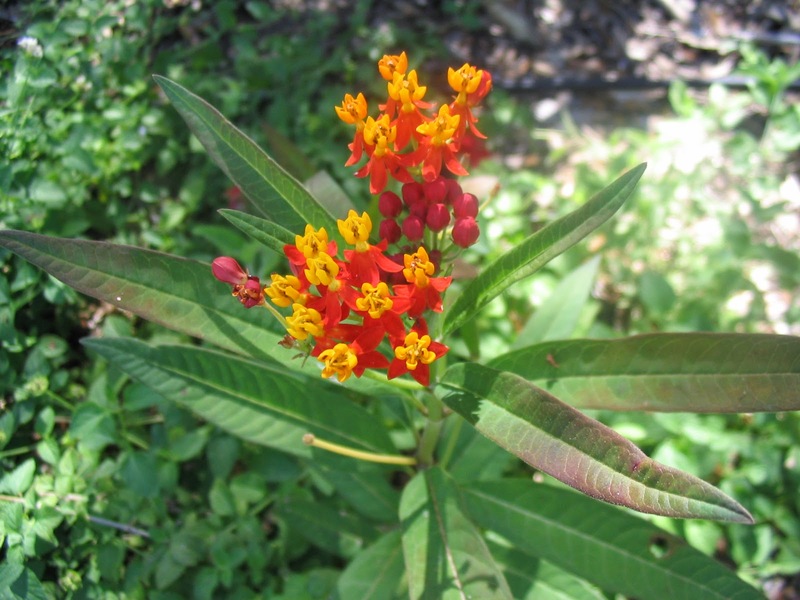 Asclepias curassavica, a Mexican and Central American native. Average watering. Asclepias eriocarpa, native to California. Xeric. Asclepias fascicularis, a California native. Xeric; can take average watering also. Asclepias incarnata "Cinderella", also known as Swamp Milkweed, is an Eastern U.S. native. Found in swampy areas, does well in moist garden environments. Asclepias physocarpa (Gomphocarpus physocarpus), a South African native. Average watering. Asclepias speciosa, native to parts of California. Xeric, but will tolerate garden watering routines. Asclepias speciosa "Davis" is a lower elevation cultivar. I'm curious to see which one will do better at close to sea level. All of these do well in containers, but A. eriocarpa may prove to be a bit of a challenge due to its long taproot. I'll keep you posted.